The motto underlying Simplified Phyics is : Physics is simple , friendly and enjoyable if presented logically and systematically. We the team of Simplified Physics , have strong faith in almight God and the saying “Honesty is the best policy”,so far as learning and teaching are concerned. The Value System : Simplified Physics value system revolves around truth , transparency & commitment. Whatever we decide , we say & what ever we say , we do. We present to you what to you what we actually are. The Support System : Interaction with parents & student to improve performance. For Making concepts of Physics strong and application oriented one should try to the understand the core concepts of Phyics in practical approach (Why and How ? )rather than theoretical /learning oriented approach. Durining 2001 to 2009 , (in FIIT JEE/ Narayana IIT Academy etc)Er.Pankaj Kumar (The Director &Teacher at Simplified Physics) has guided thousands of students, preparing for IIT JEE /AIEEE/DCE/PMT , Out Of which several are Engineers and Doctors today.His popularity among student and his dissatisfaction with top management , led him to resign from the job and start an independent Physics platform know as Simplified Physics (Started from May 2009). Simplified Physics To Make a strong foundation of Physics Understanding and Application.To Clear Concepts thoroughly and develop interest in Physics so as to score Higher Marks. Simplified Physics To Make a strong foundation of Physics Understanding and Application. Regular Classes will be devoted to CBSE Boards Examnination, (NCRT Based Teaching). Topics logically organized into smaller concepts within a chapter for quick & thorough understanding Text supported with rich and lively graphics to make the concept easy to understand. Difficult concepts are visualized through video clips (using Projector).Useful for students of XII Class just after CBSE Board Exam and Dropper Student who require Final Touch / Revission in their.. Scholarship to poor /Deserving students. Visualization of difficult concepts by video clips / using projector. Video clips backups for the missed class in case of unavoidable problem. Individual doubt discussion (IDD) facility. 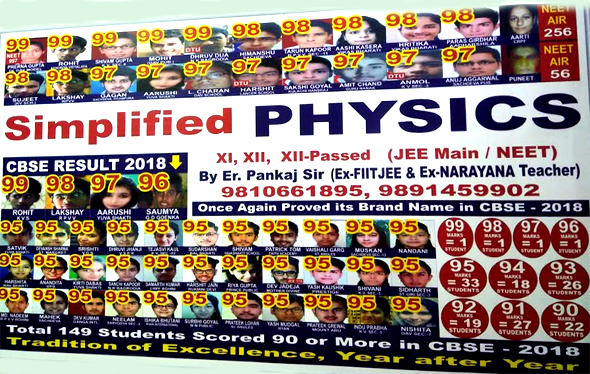 Durining 2001 to 2009 , (in FIIT JEE/ Narayana IIT Academy etc)Er.Pankaj Kumar (The Director &Teacher at Simplified Physics) has guided thousands of students, preparing for IIT JEE /AIEEE/DCE/PMT , Out Of which several are Engineers and Doctors today..
Unmatched Quality ? Non Parallel Result In Physics, By Er. Pankaj Kumar, Ex-Fiitjee ? Ex-Narayana Teacher.